The definition of smartphones has been changed. What was a large chunk of handheld portable computer which allowed to perform very little of what computers were capable of doing, has been replaced by devices who can make your life go in the dreadful flashback in a matter of seconds, if you know what I mean. The keys are a thing of ancient history and the phones are getting bigger and bigger on display. And the biggest of all amusement is the fact that how this new form of touch-screen works. Come on, admit it that whatever the touch-screens you had used in yesteryear were full with flaws and never really performed up to the mark. 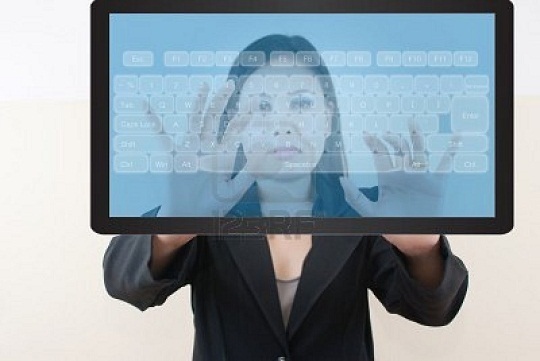 The new form of touch-screen was put on execution and we all can see how it has changed the way we interacted with touch-screens. We will see how exactly the capacitive touch-screen works on the devices of today, particularly iPhone’s touch-screen, although all the devices which have capacitive touch-screens work in the same way. The touch-screen before iPhones were of resistive type, which were made of two layers of conductive plastic, which when pressed (not touched) returned a response and behaved accordingly. This kind of touch-screen was used till 2007 by every company to manufacture touch-screen phones or other devices. It was cheap and moreover was the only form of economical touch-screen available. Capacitive touch-screens were available at that time also, but due to the price, nobody went ahead to make the bold step forward until iPhone came. The first display on iPhone was a sandwich of many layers of glass stacked together, two of which were conductive. The straight lines actually provided a form of grid that allowed touch to be recognized at a point and registered as we put a point on graph paper. A small amount of current was provided to both the layers of conductive glass. 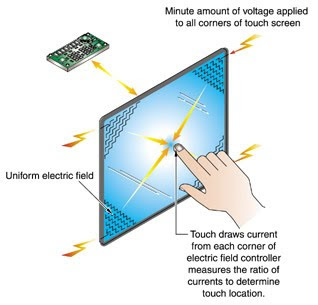 Since our hand is a good conductor of electricity, the current is soaked up by your finger(s) and the places where this happens is calculated by the hardware and a command based on that touch is established. Then again, Apple came up with another touch-screen, called the self capacitance touch-screen, where they removed one layer of the conductive glass and made way with only the one left by making it consisting of tiny capacitors. Another laminate of multiple substrates (glass usually) or in some caes a single substrate, contains a matrix of clear conductive electrodes. This substrate is then laminate to a top cover lens (glass again). When user’s finger touches the cover lens, it increases the measures capacitance of the electrodes closest to the finger. This change in capacitance is used to compute the location of the finger within the capacitive touch-screen.